I remember the times that I was struggling what seemed like every single day. I would wake up either by a crying child, dog barking at the imaginary mailman in his sleep, or the intermittent snore sounds from my hubby. Either way, it was how life initiated me into my day. Some days it didn't seem to affect me and other days it felt like every last morsel of my energy was being sucked out of me. I would squeeze in a workout, but feel hurried and rushed. I always felt like I was just trying not to let the day become a total shitshow. If it seemed to work out then I considered myself lucky and if not then I would hunker down until I crashed in bed at the end of the day, completely depleted. It wasn't all bad or terrible. I had moments of fun, joy, and happiness. In fact, there were some beautiful moments in there! The in-between moments were filled with belly laughs with the kids, milestones like crawling and walking, and destinations we had always dreamed of going to. I had 3 beautiful healthy kids, a husband I loved and a group of friends we had plans with all the time. But, it felt very much out of my control or choice. Like I just had to wait, play defense, and see what showed up for me. The problem was eventually my body and emotions started to feel the weight of this routine and habit. I started to feel so burnt out that every 2-3 months I would completely crash. Either I would be unable to get out of bed for a full day or just snap at m family because I wasn’t feeling taken care of. And then it finally occurred to me; the truth was, I wasn’t taking care of myself. If I didn’t start treating myself with care first and be the woman who leads herself first then, how could I lead my family and be a better Mom? How could I show my husband how I liked to be taken care of? How would my friends know that I needed to have girl time? I had to add myself in there because if I didn’t I wouldn’t show up as the best version of myself or worse I would get physically sick. 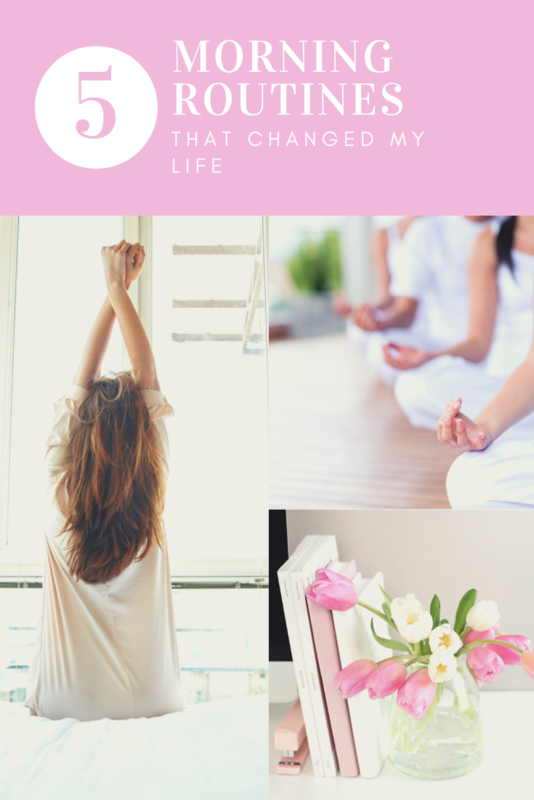 the 5 Routines that completely changed my life! Meditate- I cannot stress enough what a world of difference this will make to your entire way of looking at your life. You will start to see and hear things differently because you are centered, balanced and intentional about connecting into the stillness. You will start to relax in a whole new level. And giving your brain this mini-break has so many benefits. (read more here) There is no "right" way to meditate, so listen to your intuition. Try several different types of mediation until it sticks. And don’t try to meditate for an hour, that’s crazy. Start small like 5 minutes per day and build up. You’ll be surprised how quickly you can increase your minutes. You can download some for free from my Moksha Meditation Room. You can also search on my Soundcloud channel, where there are tons to choose from. Intentional Journaling- Write out your thoughts, they are your own, they have meaning, they have value, and you may even get clear on what your heart is trying to tell you. BE Intentional- I also write out what I want my day to look like as if it's happened in the present moment. That way I connect to the vibe of that energy that I am trying to create. *An exercise I love doing with my clients is the "I am" statements. Imagine how you want to BE. Who is the person you are trying to become? Who are you trying to BE as you step into your dream life? BE the person who would show up for their million-dollar business owner or an epic Mom, what does that look like to you? Then form the statements as if that's who you already are- because the reality is if you can imagine it, you can do it. It's epic when you see it start to happen in real life. Download my Manifestation Journal to get you started. Connect with Inspiration- First, I tap into what my spirit guides want me to know- usually done after my meditation and I just ask, what do I need to hear or know today? Just putting the intention out there usually points me in the right direction. Then I will do one of a couple of things: read a passage from my library of inspirational books like Oneness, Daring Greatly, etc. Or I will listen to one of my favorite podcasts, like the Melissa Ambrosini Show, Angie Lee Show or Rise Higher. I will also go on Youtube if I'm feeling more like seeing someone talk and will search whatever I feel like I need to hear. Things have come up from Abraham Hicks, TedTalks, and Oprah. I just allow whatever message that needs to show up and I see how I may need to incorporate it into my day. I trust that what I need to hear will show up for me all the time. Vocalize the Day- This is an exercise that has been my lastest favorite routine. Speak into your voice notes on your phone and state all the things you are grateful for- list at least 5 things. Then say how you would like your day to go, speaking in the present tense. For ex., “I will have an amazing client session with Sally and she will leave empowered to speak to her husband tonight about how she’s been feeling. “ And then finally speak in the present tense about how your future will look. Again, “ We will be living on the West coast in San Diego with everyone in the family embracing our life there.” (see how I just made everything manifest the way I am deciding to create it?) It becomes that easy! Then, at some point later in the week listen to some of your voice notes. It’s powerful when you hear these messages being spoken back to you, when you replay them. Because it’s your voice, it’s you speaking to YOU. It’s pretty cool. These are my routines, but there are so many more available to you! You can read my older post on this and see how much things have changed for me since then. I have friends and clients who deeply connect to chanting, singing, gardening, hiking in the mountains or painting. It’s whatever YOU connect with that is going to keep that spark in you awake and alive. But you have TO DO them. Speaking of to-do’s, always put these at the top and the first things that you do in the morning. Because putting yourSelf first is the first step to building your desires.